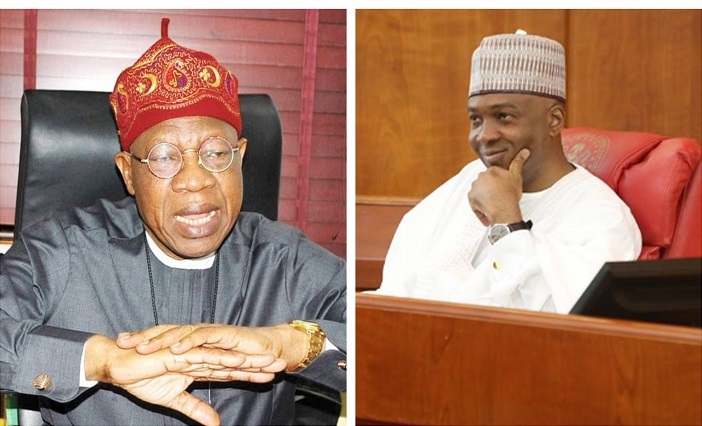 Lai Mohammed, the Minister of Information and Culture has released an audio recording evidence that Bukola Saraki, the Senate President lied about donating N10 million to the victims of Offa bank robbery. Lai Mohammed released this in a statement made available to okay on Wednesday. He said that he is presenting to the public both the unedited version of a live radio interview as well as the doctored/re-broadcast version on the donated fund to show Saraki’s disdain for truth. The minister also revealed that in the live radio interview on Christmas Day, Saraki said he donated the N10 million to the robbery victims in Offa. He revealed that it was doctored before it was re-broadcast to remove any reference to the claimed donation of N10 million to victims of the armed robbery. Lai Mohammed said he is releasing the evidence for Nigerians to see the extent to which “some leaders can go to deceive the people and peddle lies just to shore up their dwindling fortunes”. ”In the unedited live version, Dr Saraki, speaking in Yoruba, said categorically that he donated N10 million when he visited Offa to commiserate with the victims of the armed robbery. “He claimed he is donating N10 million, whereas about N7 million was stolen from the vaults of the banks that were robbed during the attack. ”However, the version for re-broadcast did not contain any reference to the Offa robbery. re-air it without the claim of N10 million donation due to the widespread derision that greeted that phantom claim. “These people have a chronic disdain for the truth,”. After releasing the audio versions, Mohammed challenged the Senate President to answer three critical questions or learn to keep his peace. “The first one is did he not say, during the live interview, that the money in the vault was N7 million and that he dropped N10 million when he went to Offa on a condolence visit? ” The second question is did he really drop any money on that occasion? Lai Mohammed said he would not want to exchange words with Saraki on who is truly on the ground in Kwraa, it is important to let him know that six weeks from now, the people of Kwara will answer that question. On Nov. 17 2018, the people of Kwara gave a hint of their determination to sack the rapacious leaders who have dominated their lives when they voted for the APC in the by-election for the Ekiti/Isin/Irepodun/Oke-Ero federal constituency. invincibility, that they started doing what they have never done before: going from ward to ward to campaign! ”Unfortunately, the game is up for them, as they will soon learn, because the people have resolved that ‘O to ge’ (enough is enough). In the meantime, they are free to continue to revel in self-deceit,” the Minister said.